The image is printed on mould-made, 100% cotton rag watercolor paper imported from France. The image is printed using specially engineered ink technology for optimum image quality and over 100 years of lightfastness. 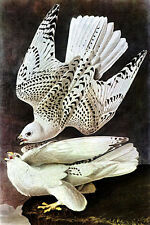 "Gyrfalcon". "Gyrfalcon" Limited to 100 prints, each print is hand numbered. The image is printed on mould-made, 100% cotton rag watercolor paper imported from France. The image is printed using specially engineered ink technology for optimum image quality and over 100 years of lightfastness. "White-Tailed Deer" This edition is limited to 100 prints, each is hand numbered. The paper size is 15" x 20". The image size is 16" X 11". 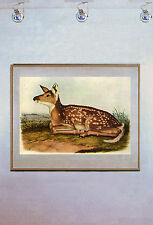 "White-Tailed Deer". The image is printed "Giclee". This fact has prompted museums and collectors to substitute Giclees for originals, thereby safeguarding priceless works in vaults. Whistling Swan. "Whistling Swan BIG" Limited to 100 prints, each print is hand numbered. The image is printed on mould-made, 100% cotton rag watercolor paper imported from France. The image is printed using specially engineered ink technology for optimum image quality and over 100 years of lightfastness. The image is printed "Giclee". This fact has prompted museums and collectors to substitute Giclees for originals, thereby safeguarding priceless works in vaults. "Jack Rabbit BIG" Limited to 100 prints, each print is hand numbered. Audubon managed to complete seventy seven drawings before failing health kept him from his work. Like that series, the Quadrupeds are wonderfully animated, superbly rendered, and beautifully printed in large format. Excellent, unused condition. This is number 386, the White Heron Heron. Wonderful colorful rare print! Similar to the Audubon Amsterdam edition! The image is printed "Giclee". This fact has prompted museums and collectors to substitute Giclees for originals, thereby safeguarding priceless works in vaults. "Silver Fox BIG" Limited to 100 prints, each print is hand numbered. The artist's enthusiasm at the start of the Quadrupeds was unbounded. In 1840, Audubon wrote to his friend and collaborator John Bachman, ?. I am growing old, but what of this?. 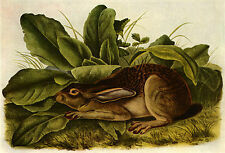 Audubon managed to complete seventy seven drawings before failing health kept him from his work. Purple Grackel. "Purple Grackel BIG" Limited to 100 prints, each print is hand numbered. The image is printed on mould-made, 100% cotton rag watercolor paper imported from France. The image is printed using specially engineered ink technology for optimum image quality and over 100 years of lightfastness. Ocelot, or Leopard Cat (Plate LXXXVI). Title: Felis Pardalis, Linn. Ocelot, or Leopard Cat (Vol. 2, No.18, Plate LXXXVI, 1846). This splendid zoological field study is derived from a professional high resolution scan of the original elephant folio stone lithograph print. I can truly say that Audubon would himself be impressed at these results. All aspects of this exacting process has succeeded as one looks sideways at the how the inks are laid down it is quite apparent that a great deal of newly developed techniques have been carefully worked out and the results are luminescent. Excellent, unused condition. This is number 386, the White Heron Heron. Wonderful colorful rare print! This is a limited first edition 1930s Duenewald lithograph, one of only 2500 printed on cotton (rag) fiber paper. Offset lithograph with descriptive text below, and another plate printed verso, printed by Duenewald in 1937. Only 1 available. Print Date: 1930s. This was published in a bound edition and there is another plate on reverse, circa 1930s. The entire sheet is too large for the scanner. This is not a signed print, and it is not a modern reproduction. Excellent, unused condition. This is number 307, the Blue Crane or Heron. Wonderful colorful rare print! John James Audubon: "Hooded Merganser" Original Litho. 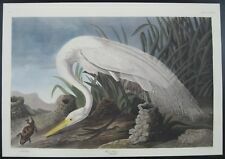 John James Audubon Colored Lithograph Goose 1871 Certificate Authenticity Wow! John James Audubon: "American Avocet" Original Litho.